If you follow regularly, you may already know that I was in Barbados last week for vacation! It was so nice to relax with my family for a couple of days & this week I'm excited to share a bunch of the looks that I wore during my trip. First up, this matching set (yup, it's a top & skirt!) from Shopbop. I loved the delicate dots & stripes print & the fluttery fabric on both the top & the skirt. Of course, you can pair these pieces together & wear them as a coordinating set! It creates a super easy & streamlined look or check out some of my styling ideas for now & later below! STYLE IDEAS FOR NOW: If you aren't on vacation & it's still a bit chilly where you live, try pairing this skirt with a lightweight sweater & neutral colored booties. It's the perfect way to wear this skirt now without freezing! (plus, it will give the skirt a slightly boho vibe which is perfect for festival season). Another idea, pair this top with some distressed jeans. STYLE IDEAS FOR LATER: This skirt &/or top (that's the great thing about matching sets - up to 3 outfits with these 2 pieces!) are festive for Memorial Day, 4th of July & Labor Day holidays. I love the idea of the top paired with shorts & sandals or the skirt paired with an easy tank & wedges. 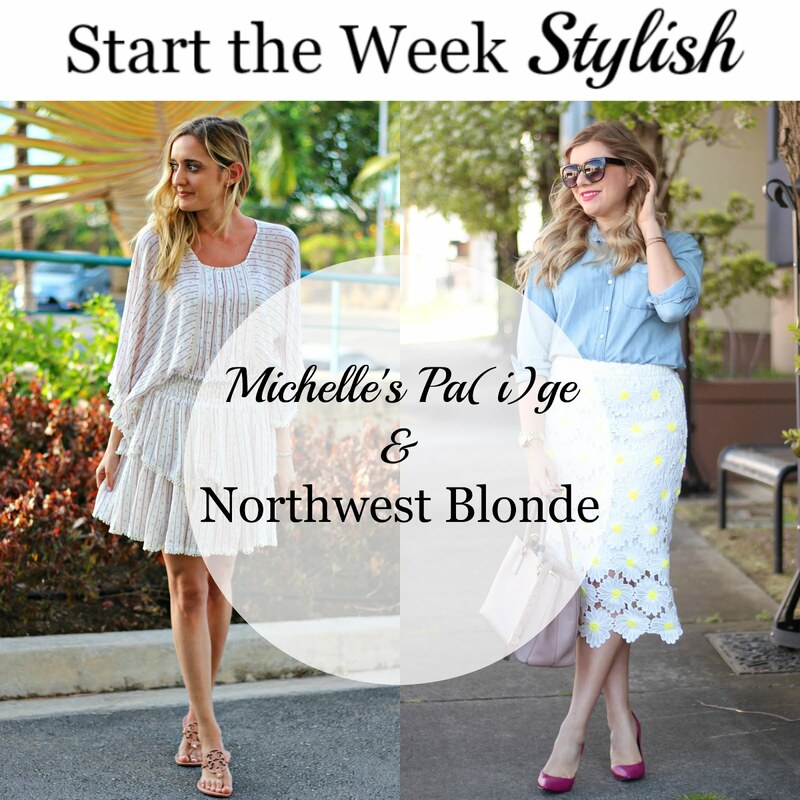 Say hello to this week's Start The Week Stylish guest host: Lindsay from Lindsay Living. Lindsay Living is a lifestyle blog dedicated to living happy, living within a budget & living your best life! 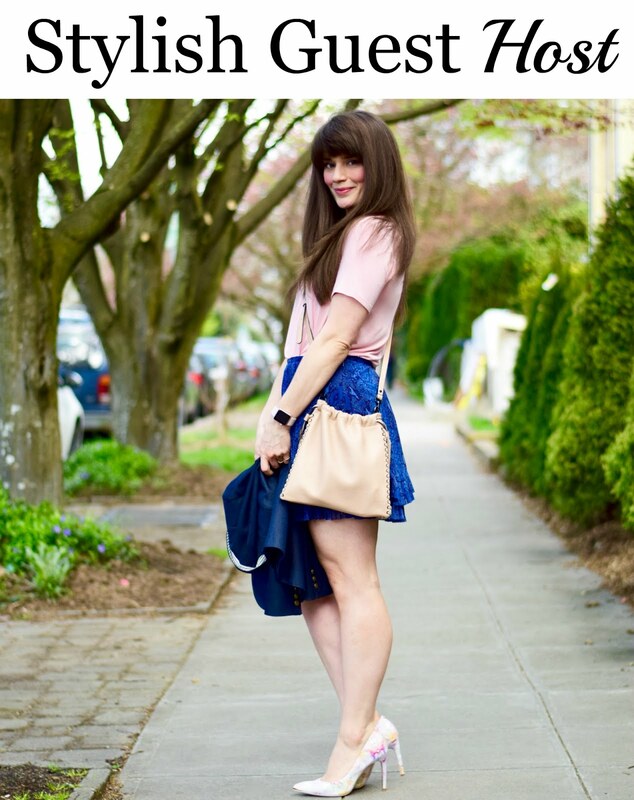 Lindsay shares her personal style, beauty tips, home decor, adventures & more. Be sure to stop by her blog this week & say hello! Last week we loved Amy Ann from Straight A Style & Karen from Lady in Violet's Easter looks. I think that's the best thing about matching sets---the ability to break them up and make them so different! In fact, I had Nancy (my 60's model) break up her set and wear the skirt for today's post!! You look gorgeous! I love matching sets too, I think they are very versatile and when combined together they always create chic and feminine ensembles. I agree! I love how many different outfits you can create! You look beautiful in your outfit, but I'm really awestruck by that palm behind you! Wow! That's amazing, I've never seen one like that before. Isn't it crazy?! I've never seen one so big! Love this set! You would never know that it's two pieces, love the different ideas to wear them separately. Barbados would be so nice and this is such a perfect outfit for warm summer nights. I also really like the idea of wearing the skirt with a sweater and little booties. That would be so cute. Thanks for hosting. I planned to wear the skirt with a sweater today but it was a bit windy...maybe tomorrow! You look so great in this!! I just discovered Moon River and am pretty much obsessed with everything in their line. Thanks for the feature!! Me too! I love all of the under $100 picks! So cute! I love separates because you can wear them together and separate! ( I mean that's the point right??) Also that gorgeous plant behind you I totally want it for my house! OMG I looove moon river! This skirt and top looks SO good on you! And I'm loving your tan! Loving this Flowy Springy Wear. Love it. Love it! That set is giving me 'Free people' vibes! Love the layers and hem detail of this outfit. Too cute! What a fun outfit! Love that it's a matching set and you can wear with different pieces. Glad you had fun on your vacation!! Looking forward to seeing more outfits from it :). I will be sharing different looks all week! I'm loving this set! Not only is it gorgeous together, but I love that they can be styled separately. I'll have to check out this brand! It's the perfect vacation set: cute and comfy!